The focus of the workshop will be on costume creation for the Mad Max Ride YYC on June 22, 2019. 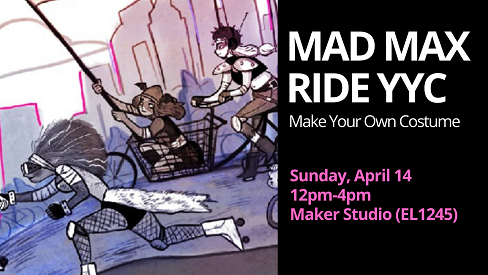 This workshop in the MRU Library Maker Studio is the first in a series leading up to the ride where participants will be offered the opportunity learn how to make their own costumes from pros in maker spaces around Calgary. We encourage participants to bring some of their own materials such as old pairs of jeans, belts, old bicycle tire inner tubes, chain, rags, etc. An array of recycled materials to draw upon will be provided. Workshop participants are encouraged to paint, sew, glue, laser cut custom pieces, use rivets, snaps or embellishments and be really creative. The hosts will create a couple of their own costumes to bring to the workshops for reference. The Mad Max Ride is a post-apocalyptic themed all inclusive active transport ride with music, art and costume. This ride is also about taking climate change action on a grassroots level without actually mentioning climate change. Influencing more people to get around via active transport instead of driving will help reduce emissions in our city. The ride will be all inclusive so all ages who ride bikes, rollerblade, use a scooter or skateboard will be invited. The post apocalyptic theme will really resonate with younger citizens and be a fun way to encourage participants to make creative costumes and decorate their wheels from reclaimed materials. The ride will roll through the inner city utilizing pathways and showcasing our fun, active transport parade to Calgarians ending at the Sled Island Block Party in Inglewood. There will be prizes for the best costumes to help motivate riders to really be creative.